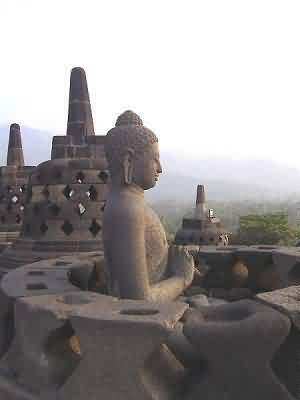 Borobudur is the largest Buddhist temple in the 9th century measuring 123 x 123 meters. Borobudur was completed centuries before Angkor Wat in Cambodia. The name means “temple in the hills“, which comes from the word “bara“(temple or monastery) and “beduhur” (hills or high ground) in Sanskrit. Therefore, in accordance with the meaning of the name Borobudur, this place has been used as a place of Buddhist worship since long ago. This temple is located approximately 100 km southwest of Semarang and 40 km northwest of Yogyakarta. This temple was built by the followers of Mahayana Buddhism around the year 800 AD during the reign of the dynasty Syailendra. In Chinese, this temple is also called ?? ?? (Hanyu Pinyin: PO Luo fu tu) in Mandarin. Sir Thomas Stanford Raffles revealed the existence of Borobudur in 1814. He found the temple is in a dormant state and ordered the area to be cleaned from the surrounding bush and subsequently conducted a survey on the state of the temple. This Buddhist temple has 1460 relief panels and 504 Buddha stupas in it area. The height was 42 meters before renovation and 34.5 meters after the renovation because the lowest level is used as a drag. Six lowest level have square shaped, three levels above it have circle shape and one on the highest levels is a Buddha stupa facing west. Each level represents the stages of human life. In accordance of Mahayana Buddhism, every person who wants to reach the level of Buddha had to through those level of life. 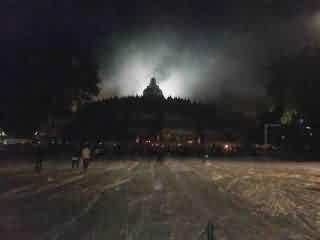 The base of Borobudur, called Kamadhatu, symbolizing human beings that are still bound by lust. Four levels above it referred Rupadhatu symbolizes man who had been able to break free from lust but still bound to manner and form. On this terrace, Buddha statues are placed in open space. Meanwhile, on three levels above it the Buddha statues are placed in a stupa with holes around it. Arupadhatu, symbolizing man who has been free from lust, appearance, form, and shape. The top part is called Arupa symbolizes nirvana, where Buddha is residing. Borobudur temple is always crowded with visitors and became the center of Buddhist worship. Specially in celebration of the feast of Vesak, the Borobudur Temple became a place to worship Buddha. At night during the celebration of Vesak, particularly during the peak of full moon, Buddhists gathered around the Borobudur Temple with candles.